Home > Market Commentary	> Attention Investors — This is Your Fed Chairman Speaking! Attention Investors — This is Your Fed Chairman Speaking! [This post is a guest column written by Tom Cleveland.] Ben Bernanke is in big demand these days. Not a day goes by that he is not making a speech, testifying in Congress, or conducting a private interview for later public consumption. Reminiscent of that investment banking commercial of old, when Ben speaks, everyone listens. Soon we may be treated to Ben’s dietary preferences or what saxophone music he likes, as if these new bits of data will reveal if a “QE3” program is definitely in the works. Why all the fuss? Money, and lots of it! Never in recent history has one man and his “merry band of bankers” weighed so heavily on daily market sentiment. Investors, analysts, and fund managers across the planet hang on his every word or shift in body language. Global financial markets have reached a critical stage in their development, either resting on a precipice or a launch pad ready to take off, depending on the degree of optimism or pessimism that “colors” your present outlook for near-term prospects. 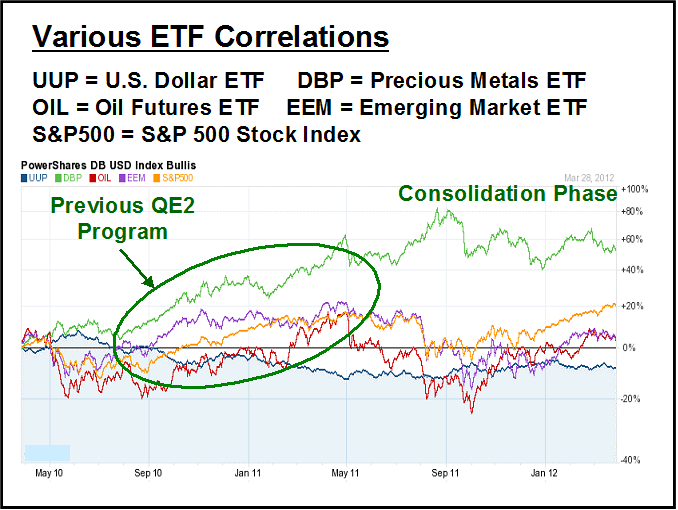 A variety of ETF correlations are presented that depict the market reaction to the last program of quantitative easing, “QE2”, as it was dubbed by the press. In May of 2011, the world was reeling from the full disclosure of potential credit problems erupting on the European front. The Fed subsequently launched its $600 billion security buy-back program to add stimulus to credit markets. These actions ignited rallies across the board, from precious metals and oil to stock valuations both far and wide. The only “casualty” was the U.S. Dollar. Expanding the money supply reduces the global purchasing power of a nation’s currency. When QE2 ended in June of 2011, the crisis in Europe escalated, bringing uncertainty and volatility to financial markets. Many investors scurried for the exits, choosing to sit on the sidelines, while Ben’s “gift” provided the stimulation the market needed for another broad-based rally. Positive economic data confirmed that a recovery was really taking shape in the U.S. market, although the housing sector has been stubborn, refusing to shed its “shadow” inventory, even with interest rates at all time lows. Disposable income has yet to rally, a necessary action to ensure an increase in mortgage loan qualifications. Fast forward to the present, and we find ourselves in “consolidation” mode, once again across the board. Will another dose of stimulus in the form of “QE3” come down from on high? Only Ben knows for sure, and he does not easily share his thoughts for the imminent quarter at hand, despite the large magnifying glass that is pointed right at him. Many analysts thought an update in December GDP figures and prior jobless claims would tip Ben’s hand, but the market barely moved a notch. Bernanke and his fellow board governors are tight-lipped on the topic, although now everyone is on the edge of their seats waiting for hints from each man’s speaking engagements. The truth is that the past is not their concern. The current stage of development and leading indicators are more a reference point for where their feelings actually lie. Employment data has surprised Ben and others, suggesting that we may be getting ahead of ourselves, as if that were a bad thing. If we truly have “borrowed” a bit of growth that was not to come until later, is that reason enough to go to the “QE3” pump? A big change in direction is imminent, but which way? Stay tuned! Article by Tom Cleveland from forextraders.com. Tom Cleveland has over 30 years of experience in the international payments industry and currently manages his consulting business and authors various guest columns. Tom’s writing on business issues has appeared in the NY Daily News and BusinessInsider among others.